Three playing cards vanish and then reappear in your pocket. Here is a treat for serious card lovers. A gimmicked version of the amazing 'hallucination' plot along with 5 further non-gimmicked handlings. Ed was always thorough, and here it shows in style. In effect, three spectators each look at the top card of the deck, one at a time. The performer comments about how people often have problems recalling details, and how various descriptions of the same event can vary dramatically. He offers to prove his point. Climax 1: The spectators each name their cards and they are ALL DIFFERENT! Climax 2: Without any moves the top card is flipped over, IT IS A JOKER! Climax 3: Without any moves, the three cards are withdrawn from the performer's pockets! Based on an effect from Jinx #1, (1934). Ed reworked the Eddie Cleaver concept eliminating the "second deal" and "palm". Ed's wonderful gimmicked and non-gimmicked versions originally appeared in New Directions Magazine in 1985. The handlings were spread over several issues, and the distribution was only in the low hundreds. It is an absolute pleasure to bring all the handlings together under one cover and to present them to a broader and modern audience. The language of the era is preserved, and Ed's famous attention to detail is evident throughout. 1st edition 1985; 1st digital edition 2009; 20 pages. 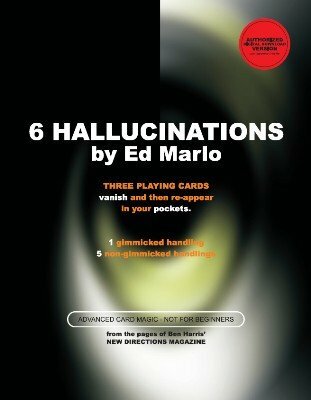 6 Hallucinations by Marlo is taken from the pages of Ben Harris’ New Directions magazine. Right on the cover it says “Not for Beginners” and I concur. Five methods are given for producing the effect in which three spectators are each shown the top card, each one sees a different card, and then the card is shown as a joker. The cards seen are then produced from the pocket. The methods are more or less graduated in difficulty, starting with gimmicked cards and ending with a method using palms, lapping, and a Curry change. This is Marlo’s style giving multiple methods for the same effect. Not all the slights are described; one of the suggested palms may be found in Marlo without Tears. I enjoy reading Marlo, even if I don’t always attempt the effects.